TreeSteward Mark Priest, who also volunteers with invasive plant removal projects, found the book Wild Urban Plants of the Northeast: A Field Guide thought provoking and offers the following review. 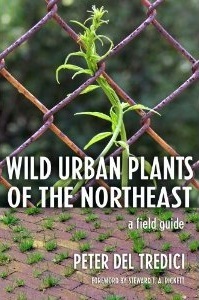 Wild Urban Plants of the Northeast is an interesting new book by botanist Peter Del Tredici. (©2010 by Cornell University, Cornell University Press, 374 pages) Del Tredici’s goal is to encourage interested readers to explore the urban and suburban flora that surrounds us every day. The idea for the book came out of his field biology field trips where students would study the native plants they discovered but leave mostly ignorant of large stands of exotics that dominated certain parts of the landscape. The “spontaneous urban vegetation” covered by the book includes many plants that we would immediately recognize as ugly nonnatives and invasives. Del Tredici encourages us to broaden our minds when considering these familiar plants in urban and suburban settings because they are providing ecological benefits. In fact, these plants are thriving in an environment in which most of our native plants are no longer able to be successful. We have permanently altered the urban landscape and it is unrealistic to believe we can simply restore a native flora to an environment which is not the one in which it has evolved. The urban environment includes many areas with compacted and poor soils, full sun, drought conditions, and high salinity due to winter salt treatments on roadways. Plant species that we normally consider noxious and harmful, such as Ailanthus and Norway maple, can thrive in these areas. Del Tredici argues that we are better off with these exotics if the alternative is no plant at all. The bulk of the book is a field guide that is organized by plant family. Each species is allotted two pages and there are many pictures. The intent is for you to browse through the book and spot the plant you want to identify by picture. There is an appendix describing the major characteristics of the most common families covered in the book to help narrow the search. There is an index but no identification key. A unique aspect of the book is that each species description includes a section on the ecological functions of the plant and on its cultural significance. The sections on cultural significance are very interesting and help explain why many of these plants were originally introduced. I had more luck with plant identifications when I used this book in conjunction with Weeds of the Northeast by Richard Uva, et. al. That book includes some useful identification keys that make it easier to find plants without an exhaustive search of all the pictures in the text. The format of the species entries in both books is very similar but Del Tredici’s book is much more fun to browse as it has so many interesting tidbits in the sections on cultural significance. Del Tredici encourages us to consider the benefits provided by the urban volunteers described in the book and not to simply dismiss them as useless and damaging. We often vilify these plants and see them as ruining the environment when, in reality, it is humans who have done so. As Del Tredici writes, “the plants described in this book are well adapted to the world we have created and, as such, are neither good nor bad – they are us. Definitely getting this! I love the increased interest in urban ecosystems.